Isn't always nice to know when you're adored. The relationship of Stella and Angus (be it dog or turtles) reminded me of an adoration that is hard to find these days. My grandparents will be married 72 years this year. They have that kind of love that just makes one feel adored. They have loved and been loved for so long. It's easy to see how much they adore one another in their every day actions and glances. He holds the door or her chair, he stands when she comes to the table, he carries her purse when we go to lunch...that bugs her a little...he doesn't seem to mind. Today I wanted to share a little adoration your way. 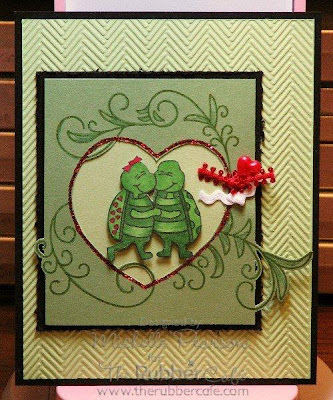 Here we have Stella and Angus (the turtles) having a romantic ride on the water, sharing smiles and adoring glances. 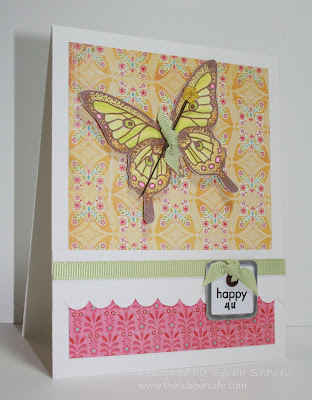 This is the third post in a row that showcases a butterfly stamp. It must be that we all are longing for spring or something. 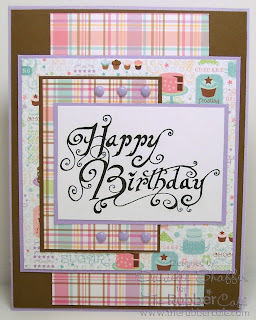 Or the fact that these stamps are simply wonderful to work with! 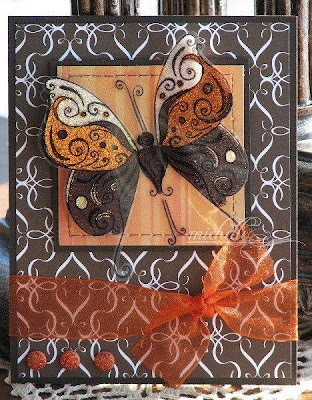 This beauty is called Large Highwing Butterfly and is so easy and fun to make cards with. 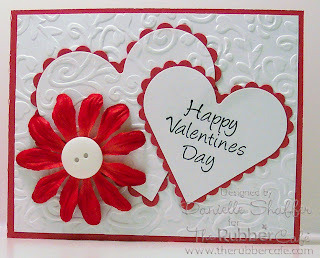 You don’t need to do much but stamp and color it and you have a lovely card. On this one I colored it up with my copics and layered two images and pushed up the wings some to get a 3D effect. Good things are going on over at The Rubber Cafe. We're working on our show schedule as well as our teaching schedule. Keep an eye on the blog for more information. Hi all! Hope you’re having a good start on the new week. We (that is Sweden :D) won our first Olympic gold minutes ago so things are grand around here! Wohooo! 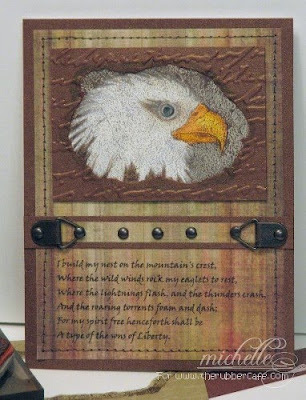 Today’s card is a Tea Bag Holder Card. I love this folding, it’s pretty easy and people LOVE to get a little gift like this. I sometimes exchange the tea bags with small chocolate bars. That is yummy too! HERE is a tutorial if you want to try it yourself. The front is decorated with one of my all time favorite Rubber Café images the Curled Mug. The photo angle turned out a little crazy, but you get the idea. Take care! I’m heading back to the TV sofa and the Olympics! What to bring ??? Sissors , Adhesive ... and the want to play with Copic Markers , Glimmer sprays , embossing powder and lots more fun stuff . I have been on a roll with the glitter lately.....one of my favorite techniques, so you get THREE cards to look at today! 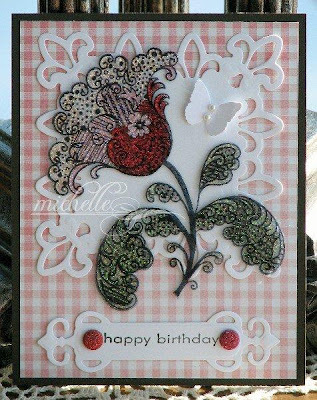 This card features the gorgeous Paisley Tulip. that has been stamped on acetate with Stazon ink and glittered. If you like the image and need it for your collection, email Melissa! 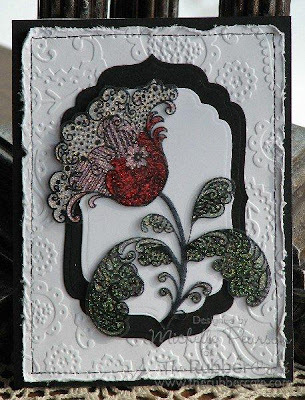 This card features the Large Celtic Rosette. 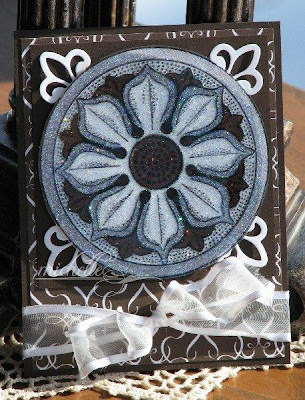 If you'd like this image, you'll have to email Melissa and ask for the Large Celtic Rosette, and tell her I sent you!! 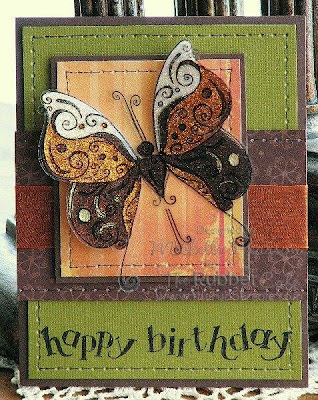 Finally, this card features the Large Swirl Butterfly. 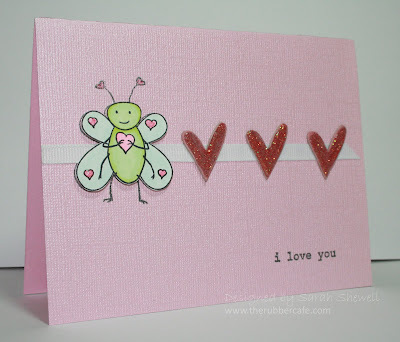 The wings are popped up on dimensional dots so it this card has a lot of dimension! 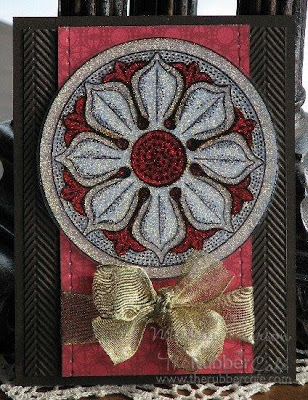 All of these are gorgeous in real life....beautiful stamps are showcased to perfection with the glitter! This year, I wanted to keep the Valentine's for the Kids' Teachers quick and easy. I pulled out my Heart Nestabilities and Bubblegum Machine stamp set and whipped this together in a matter of minutes, and then made 7 more (2 teachers, 3 Teachers Assistants/Helpers, 2 After School Helpers and the Daycare Provider, whew!) for a total of 8. It took me less than an hour! 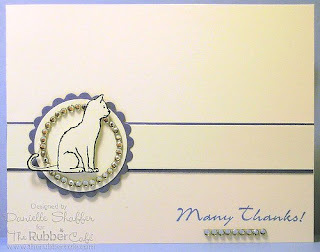 Have you seen Lisa’s fun tutorial and challenge for a Flip Flop Flag Card? You can find it HERE. And I simply HAD to try that out. It was fun, and it’s sooooo cool to open the card up and see the 3D effect! Try it! And share it! Here is my take. 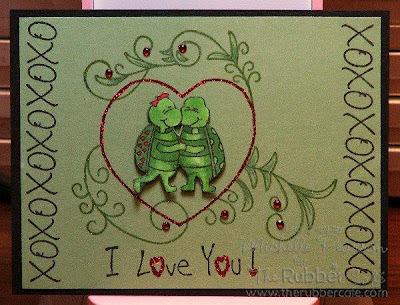 Yes, I’ve used these stamps before… But they ARE my favorites, and Valentine’s day is just around the corner! *smile* The dog is Labrador Love, the sentiment is one of great but small sentiments included in Just My Type. Now it’s your turn to try it out! Good luck! 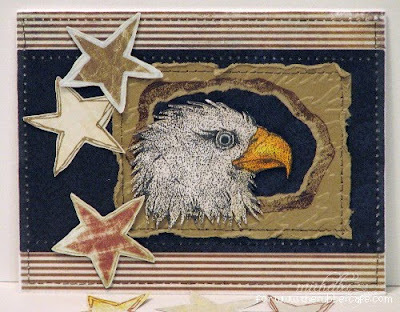 · 2 pieces of cardstock 5 ½" x 8 ½"
· Acetate strips 1" x 3"
· "Flag" pieces to go at the end of each strip of acetate. 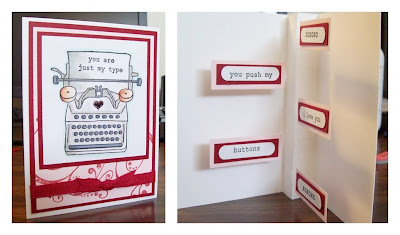 1) Score one sheet of cardstock in half to make your A2 card. 2) Score second sheet of cardstock at 3 ½" & 5". 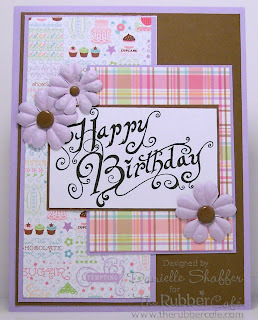 Flip cardstock over and score at 4 ¼". Fold on score lines accordion style. 3) Line the front of the card (piece scored in half) with the inside of the card (piece scored accordion fold) and attach together. Do the same for the back of the card. 4) Attach each piece of acetate to the inside middle of the card in a staggering formation. Now that you have the tutorial, comment and add a link to your flip flop flag card. This is a Rubber Cafe Challenge...so when you upload to a public site, like splitcoaststampers.com, please link back to this tutorial and add The Rubber Cafe and TRCC3 in your tags. 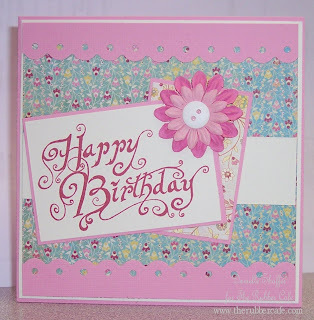 A stamper can never have too many birthday cards, and I had a great time creating these fun birthday cards with my new Swirled Happy Birthday stamp from The Rubber Cafe. 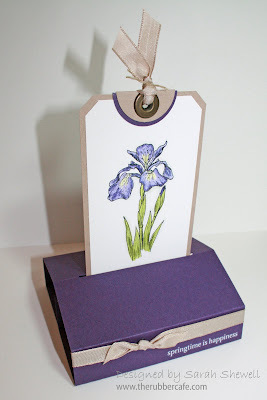 I used scraps on these cards, so they were quick and easy. The image is stamped in Versafine Black Onyx, which I'm finding gives a very crisp stamped image. My favorite part about these cards is that they were quick. 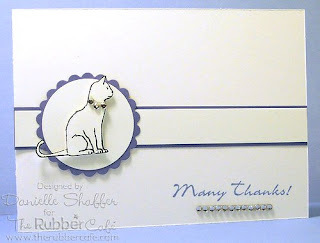 I love having a stamp around that I know I can use in a jiffy and it will always produce a nice card!